A diagnostic test used by hospitals says a recently isolated strain of bacteria is susceptible to the last resort antibiotic colistin. 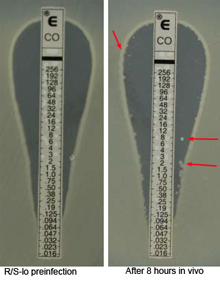 After eight hours of infection in an animal, signs of resistance to colistin are apparent (red arrows). This phenomenon of "heteroresistance" could be causing unexplained treatment failures. A diagnostic test used by hospitals says a recently isolated strain of bacteria is susceptible to the "last resort" antibiotic colistin. But the strain actually ignores treatment with colistin, causing lethal infections in animals. In Nature Microbiology, scientists led by David Weiss, PhD, describe colistin-heteroresistant strains of Enterobacter cloacae, a type of bacteria that has been causing an increasing number of infections in hospitals around the world. The colistin-heteroresistant bacteria were isolated from blood or urine samples from patients at Atlanta hospitals. One strain called R/S was discovered through a collaboration with Eileen Burd, PhD, director of clinical microbiology at Emory University Hospital. A separate strain called R/S-lo was identified by Sarah Satola, PhD and Monica Farley, MD at the Georgia Emerging Infections Program. In R/S, the colistin-resistant subpopulation made up about 5 percent of the total. This subpopulation could be detected with a standard clinical test for antibiotic resistance (Etest®). R/S was also resistant to several other antibiotics. In R/S-lo, the resistant subpopulation was only about 1 in every 10,000 bacteria, which could not be detected with Etest. Despite the tiny starting fraction of resistant bacteria, R/S-lo can withstand colistin treatment and cause a lethal infection in mice. “We are working on more sensitive diagnostic techniques, which would be required to catch strains like this in the clinic,” Weiss says. Infectious disease experts were concerned about a November 2015 report from China of colistin resistance in another type of bacteria (E. coli), because in that case, resistance was carried on a mobile piece of DNA, known as a plasmid, which can spread to other bacteria. Here, the resistant and susceptible subpopulations of R/S are genetically identical, the researchers report. However, the resistant subpopulation has a different pattern of gene activity, and the researchers were able to show that the bacterial gene PhoQ was critical for colistin resistance. “We haven’t tested this yet, but it suggests an add-on PhoQ inhibitor could re-sensitize some bacteria to colistin, or perhaps a less toxic relative of colistin, which other researchers are working on,” Weiss says. Colistin is viewed as a last resort measure for bacterial infections that are resistant to other drugs, partly because it is poisonous to the kidneys. It works by disrupting bacterial cell membranes. In the R/S strain, resistance appears to involve the bacteria modifying the lipid components of their membranes, but the precise mechanism is not clear, he says. Experiments with mice suggest that the infected host’s immune system stimulates the program of colistin resistance in the R/S bacteria. The resistant subpopulation keeps growing during colistin treatment, distinguishing heteroresistance from a related phenomenon called persistence, in which some bacteria avoid antibiotic toxicity by becoming dormant. The research was supported by the Burroughs Wellcome Fund, the Department of Veterans Affairs (BX0027880), the National Institute of Allergy and Infectious Diseases (AI098800) and the Georgia Emerging Infections Program.